This month’s Featured Artist is a never-to-be-forgotten Native American. Darrell Jumbo, a.k.a. “Elephant Man,” was born on ancestral land on the Navajo Reservation in a remote area of the Chuska Mountains in eastern New Mexico. Darrell and I met in 1995 when I was conducting one of my American Indian art field trips. Darrell immediately impressed me - especially his silver jewelry. He is probably best known for his silver pins, which are boundless depictions of numerous animal characters. More often than not, Darrell’s animal pins are behaving as if they’ve just been told the most hilarious tale. One look at these creatures, and you can’t help but chuckle. Darrell insists, “My pieces don’t make fun of animals, but of our human nature as seen through them.” Sometimes, the elements of our nature that Darrell is poking fun at are absolutely apparent as he provides helpful clues in the funny names with which he often entitles his jewelry pieces. Other times, even with a title in place, we’re left to ponder the exact meaning behind his wonderful artwork. Darrell and I at his Heard Fair booth. If you come to Indian Market in Santa Fe this August or to the Heard Fair in Phoenix next March, look for Darrell Jumbo in his booth. 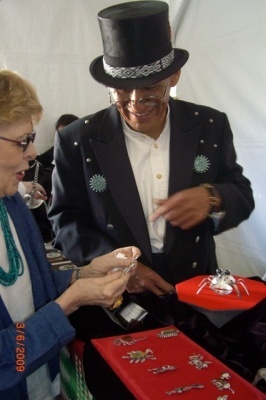 You can’t miss him in his top hat and formal morning coat and tails, distinctive attire not to be confused with any other Native artist. In the meantime, enjoy a peek at this Navajo jeweler’s fine silver pins. 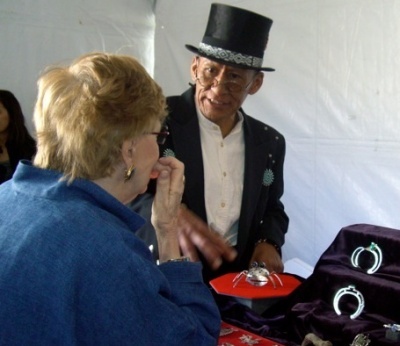 Click here in order to view a video of Darrell Jumbo discussing his jewelry. I admire one of Darrell's fun silver animal pins.